Whether you’re looking for the best small rolling cooler or something a little more polished to keep on your back porch for summer barbecues, you’ve come to the right place. There are a lot of different options out there which is why we researched some of the most buzzed about products and put together this guide. Before we get started, let’s take a look at some of the key things you need to know about before you shop. Capacity: This figure tells you how much space the cooler has available. It's usually measured in quarts. For our picks, the capacity ranges from 30 to 100 quarts. The bigger the capacity, the more a cooler can hold. 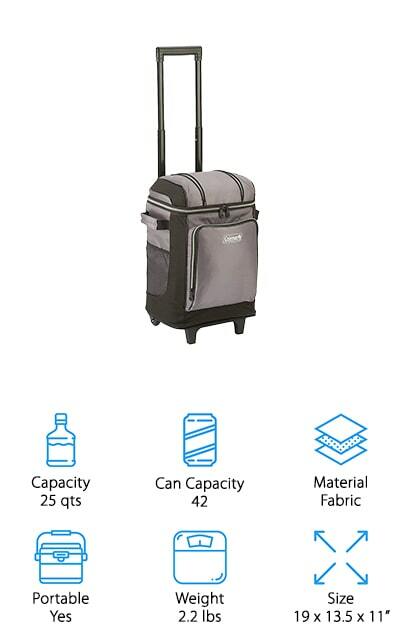 Can Capacity: Can capacity is a much more relatable way to determine how much you can fit inside a cooler. For our picks, it ranges from 37 to 96 so, as you can see, there’s quite a range to pick from. Material: We found rolling coolers made out of plastic, steel, canvas, and even rattan. There are a lot of options available. The cool thing is that, no matter how you plan to use your cooler, the perfect material is out there. Portable: All of these coolers are portable simply because they all have wheels. That said, some of them are designed to roll from one side of your deck to another while others can go with you camping or to the beach. Weight: Weight is important when it comes to anything portable but it’s particularly important with coolers because you’ll be filling them with other heavy things. The lighter an empty cooler is, the better, especially if you’ll be pulling it across different terrains. Size: For coolers that you can take with you, one of the big things to keep in mind is that it will need to fit in your car. Make sure you choose one that won’t make transporting it too difficult. Now that you know what to look and have a better understanding of how to pick a rolling cooler, let’s move along into our reviews. Here’s the deal, our top and budget picks are the first items you’ll see so check them out if you’re in a hurry to get an idea of the range that’s out there. Stick around if you can, though. Whether you want the best soft rolling cooler or something awesome for your backyard, we got you covered. 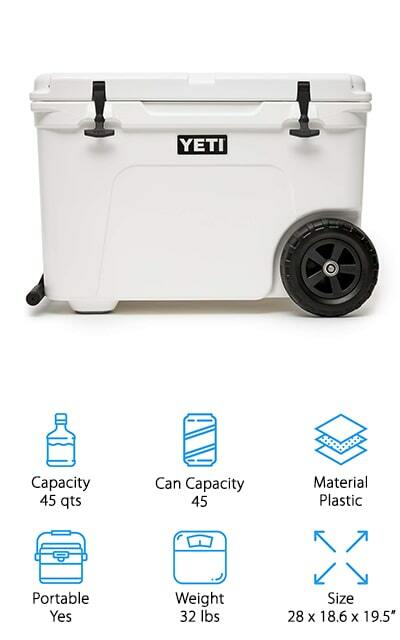 Our top pick is a best rated rolling cooler from YETI is actually the first rolling cooler that the brand has ever made. Their coolers were already some of the best ones out there, all they were missing was wheels. The Tundra Haul features 2 large tires that use single-piece construction so that they are impact and puncture resistant. 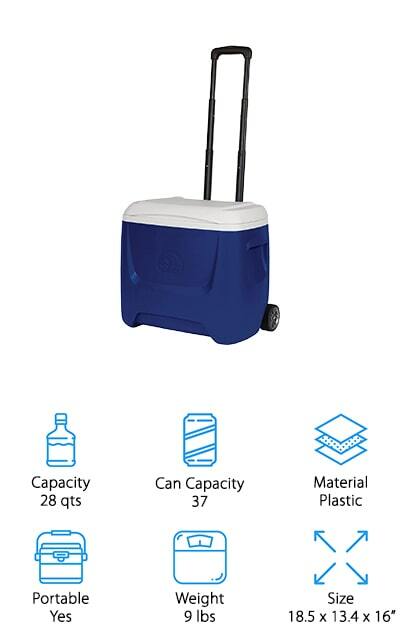 The arm is made of lightweight, durable aluminum and features a comfortable handle grip so it’s no problem pulling this cooler to wherever you want to go. The cooler itself uses PermaFrost Insulation and Rotomolded construction that keeps your food and drinks cold even in temperatures exceeding 100 degrees F. That’s not all, it’s a decent size, too. With a 45-quart capacity, it can hold up to 45 cans at once. The Coleman Xtreme Wheeled Cooler is up next. Our budget pick is affordable but still has a lot of great features that make it a really great buy. For one thing, it’s pretty spacious and can hold up to 84 cans at once. 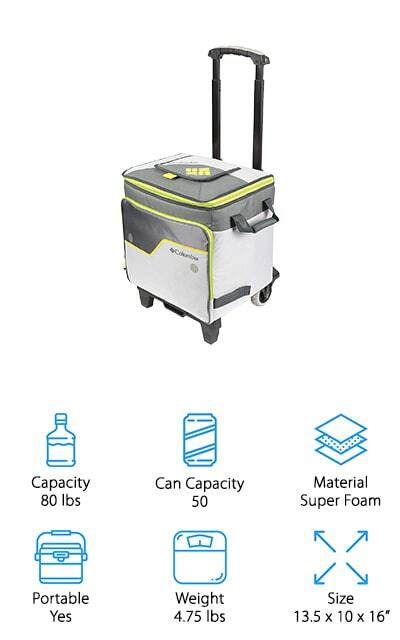 A telescoping handle and heavy-duty wheels make for convenient travel over a variety of surfaces and the superior insulation provides 5 full days of ice retention in temperatures as high a 90 degrees F. Pretty impressive. This is a good choice for big trips or group outings. There’s just so much room. 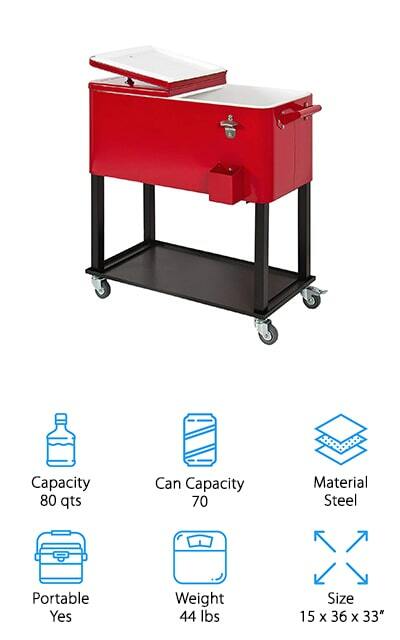 It can hold plenty of cans as well as condiments, meats, and other perishables which make it indispensable at barbecues and outdoor picnics. Plus, there are 4 cup holders molded into the lid for added convenience. If you’re looking for the best small rolling coolers, the Igloo Island Breeze Roller Cooler is right up there as one of the best. There are molded handles on either side that make lifting in and out of your trunk simple. When you arrive at your destination, getting to your picnic spot is easy thanks to the telescoping handle and soft-ride wheels. You can easily pull this cooler using one hand leaving your other hand free to wrangle your kids, hold onto your dog’s leash, or carry additional supplies. The bottom of the cooler uses a special patent-pending design that keeps it elevated and prevent unnecessary contact with the hot ground which can keep your supplies colder, longer. That’s not all, it’s also covered with a 1-year warranty. If you didn’t know coolers could be sophisticated, you have to check out the TRINITY TXK-0802 Cooler. What makes it so special? 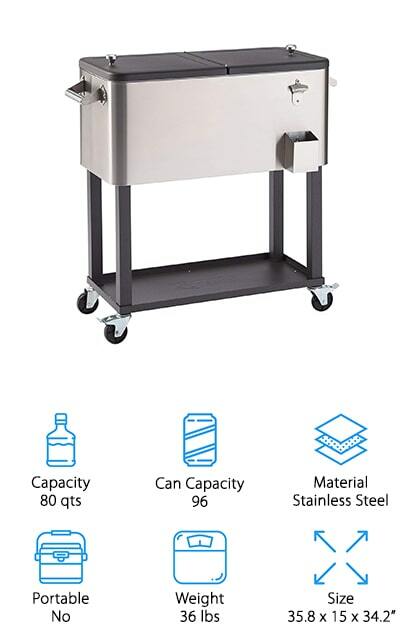 For one thing, it’s made of high-quality stainless steel with a speckled dark bronze finish on the lid, shelf, and legs. So, yes, this cooler is fancy. Rolling casters make it easy to roll around on hard surfaces and there are an attached bottle opener and cap catcher for convenience. Plus, there’s a large shelf on the bottom where you can store other necessary supplies like an extra case of beer or bottles of mixers. This is the perfect cooler for a pool party or backyard barbecue. While it might not be your go-to for tailgating, it definitely looks a lot nicer at a party than a standard plastic cooler. 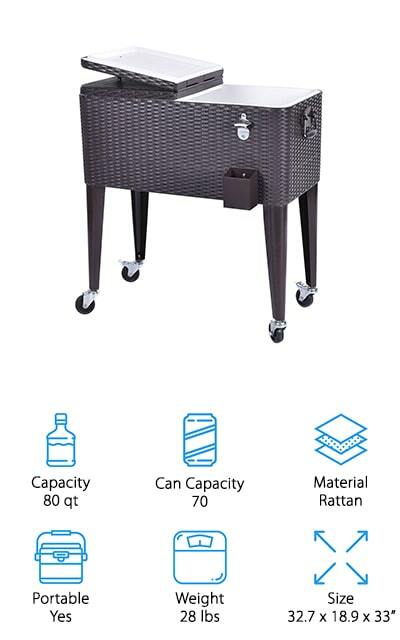 Another awesome option for a backyard cookout or an afternoon by your pool is the Best Choice Products Rolling Cooler. It’s made of steel with a bright red powder coat finish that’s durable and eye-catching. 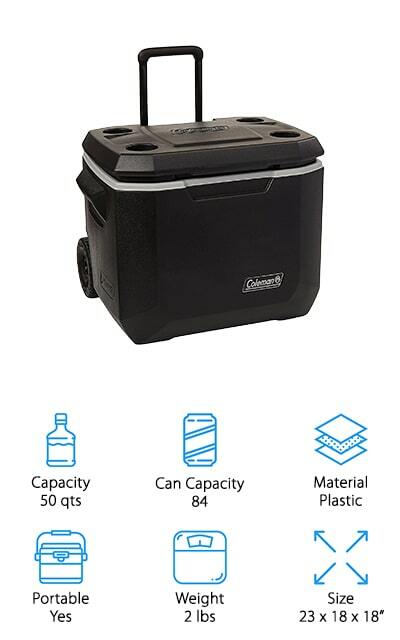 This cooler holds up to 70 cans and has a drain plug for easy cleanup. The built-in bottle opener and catch tray are really convenient, too. Side handles and casters make it easy to move around on your patio and, thanks to the 2 locking wheels, it’ll stay put when you get it in place. There’s also a large bottom shelf that can be used to store other party necessities, like cups, mixers, snacks, or an extra case of beer so when the cooler needs to be restocked, you won’t have to go far. Next up is our pick for best soft-sided rolling cooler, the Columbia Thermal Pack Cooler. It has a 50-can capacity and features a foldable cart, telescoping arm, padded handles, and all-terrain wheels for easy transport. The interior is lined with Therma-Flect material that reflects heat to keep it away from the contents of the cooler. This material was originally designed to keep astronauts cool in temperatures of up to 250 degrees F so you can bet that it does what it says it’s going to. Super foam insulation helps keep the cold in, too. The lining is leak-proof and features built-in Microban technology to protect against bacterial odors and stains. That’s not all, it’s removable, too, so that everything is exceptionally easy to clean. The best beach rolling cooler we found is something a little different. As you probably guessed from its name, the Rockpals Electric Cooler is electric. It comes with an 8.5-foot long car adapter so that you can plug it whether you’re keeping it in the back seat, trunk, or truck bed. Here’s the neat thing about this one, it can cool down to 45 degrees F without any ice. If you want to keep your food cooler, you can add ice and, because the cooler runs at a low temperature, the ice should last a really long time. There’s another way to use this product, too. Just set it to “warm” and it heats up to 140 degrees F to keep your food warm during travel. The Coleman Soft Cooler is another great choice if you want the best rolling cooler for beach. The main compartment features heat-welded seams to prevent leaking and the liner is treated with antimicrobials that resist mold, mildew, and odors. This is a great choice for travel, too. It collapses for easy storage but when you need it, it expands to hold up to 42 cans and has a hard plastic liner that provides more structure and support. That’s not all, there are also a few pockets for extra storage, including a large zippered compartment on the front and smaller mesh pockets on the sides. A telescoping handle and durable wheels make it easy to pull over different terrain. 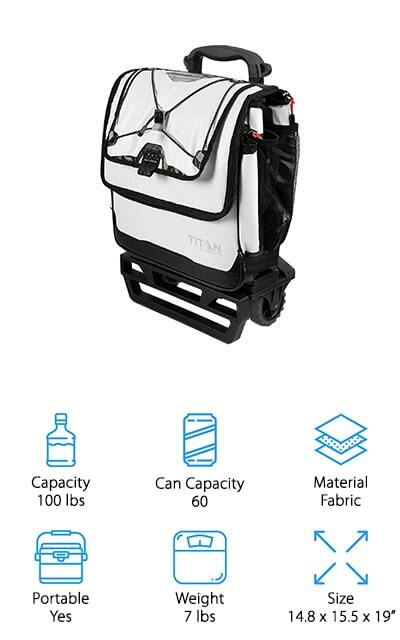 Another top-performing soft-sided rolling cooler is the Arctic Zone Titan Cooler. It uses 3 layers of high-performance insulation and a radiant heat barrier to keep your food and drink as cold as possible for as long as possible. The interior leak-proof lining also has Microban which protects against bacteria and odors while resisting stains and making cleanup quick and easy. That’s not all, the exterior is abrasion and puncture resistant and won’t crack over time. The extra-wide base, all-terrain wheels, and retractable handle are easy to maneuver and there’s also an adjustable shoulder strap if you want to use it without the wheels. This cooler holds up to 60 cans and has an expandable insulated front compartment where you can stash things like condiments and prepared sandwiches. Last up is the Giantex Rolling Cooler Cart, a great choice if you want to take your backyard parties to the next level. This rattan cooler cart features 4 multi-directional wheels for easy mobility. To make sure it doesn’t get knocked over or pushed around during the party, 2 of the wheels lock to provide greater stability. It features a built-in bottle opener and cap catcher that are super convenience while also helping reduce the time you’ll spend cleaning up. There are 2 side handles for easy movement and dual top lids so you can access the cooler without letting all the cold air out. 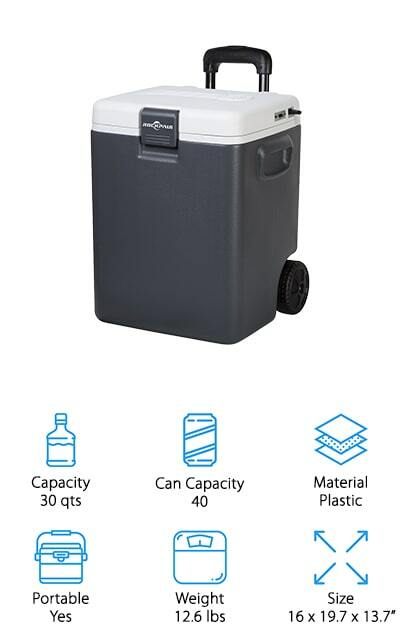 This cooler holds 70 cans or about 50 bottles and can keep food and drinks cold for up to 36 hours.